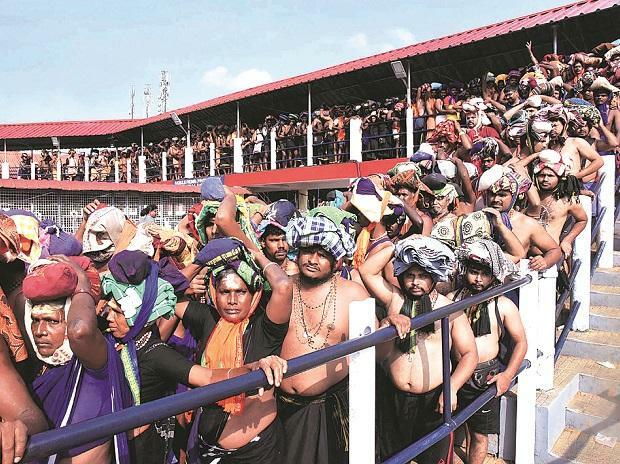 Fifty-one female devotees in the age group of 10-50 years have entered the Sabarimala temple through an online process since the Supreme Court removed the bar on their entry in September last year, the Kerala government Friday told the apex court. The submission was made during the hearing of a plea filed by Bindu and Kanakadurga, the two women who had entered the temple on January 2, seeking security. The apex court ordered the state to provide two of them round-the-clock foolproof security. A bench of Chief Justice Ranjan Gogoi and Justices L N Rao and Dinesh Maheshwari said it was only going into the aspect of security of the two women, and would not like to entertain any other prayer made in the petition. "We deem it appropriate to close this writ petition at this stage by directing the State of Kerala to provide adequate/full security to the petitioner Nos. 1 (Bindu) and 2 (Kanakadurga) herein which would be provided to the petitioners round the clock," the bench said. It was hearing the petition of 42-year-old Bindu, a college lecturer and CPI(ML) activist from Kozhikode district's Koyilandy, and Kanakadurga, 44, a civil supplies department employee from Angadipuram in Malappuram, who had entered the Sabarimala shrine on January 2. At the outset, senior advocate Vijay Hansaria, appearing for the Kerala government, told the bench that till now 51 female devotees have entered Sabarimala temple and all of them are being provided adequate security. "In this regard it is submitted that a total of 7,564 women between the age group of 10-50 years had registered for darshan and as per the digitally scanned records around 51 women in this group have already visited the shrine and had darshan without any issue," the note of Kerala government given to the court stated. He said that the two petitioners were given adequate and effective protection from the temple to a safe place and they continue to remain under protection. "It's all right, if you (Kerala government) are already providing security to them without the court's order then there is no harm if you continue providing adequate security round-the-clock after the court's order," the bench said. The note said a contingent of four officers and one women police officer is on protection duty for Bindu and a mobile patrol moves round the clock near her house and surroundings. "Kanakadurga, who is presently in the Calicut Medical College, after an assault on her by her mother-in-law is also provided protection of around 19 police officers, including women officers placed both inside and outside the ward. Her house is also accorded effective police protection," the note of the state government said. The bench also rejected the contention of senior advocate Indira Jaising, appearing for the petitioners that the matter be tagged along with the pending petitions in the Sabarimala case. "The prayer of the counsel for the petitioners to tag the present writ petition with the Review Petitions and other connected cases is rejected," the bench said. The top court also refused to enter other prayers made in the petition saying, "We do not consider it necessary to go into any of the other issues raised in the present writ petition".Advocate Mathews J Nedumpara, appearing for some petitioners, who have filed a review plea challenging the decision of the top court to allow women of all ages to enter the temple, said that it is incorrect to say that female devotees have entered the Sabarimala shrine. "The DGP has ordered a preliminary enquiry by SP (superintendent of police of) Pathanamthitta (district) in this regard and further legal action will be taken based on the PE report," the state note said. Earlier this month, the two women had stepped into the hallowed precincts guarded by the police, more than three months after the apex court's historic judgment lifting the ban on the entry of girls and women between 10 and 50 years of age into the shrine of Lord Ayyappa, its "eternally celibate" deity. There are around 48 petitions seeking review of the judgment.